Commonly called the "saber-toothed tiger," the extinct cat Smilodon fatalis roamed North and South America until 10,000 years ago, preying on large mammals such as bison, camels, mastodons and mammoths. Telltale clues from bones and teeth suggest they relied on their forelimbs as well as their fangs to catch and kill their prey. 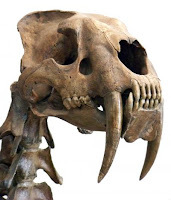 The size and shape of sabertooth canines made them more vulnerable to fracture than cats living today, said author Julie Meachen-Samuels, a paleontologist at the National Evolutionary Synthesis Center in Durham, NC. "Cats living today have canines that are round in cross-section, so they can withstand forces in all directions. If the prey is struggling it doesn't matter which way it's pulling — their teeth are unlikely to break," she explained. In contrast, the elongated canines of saber-toothed cats were oval in cross-section, which made them more vulnerable to breaking than their conical-toothed cousins. "Many scientists infer that saber-toothed cats killed prey differently from other cats because their teeth were thinner side-to-side," said Meachen-Samuels. Despite their vulnerable canines, prominent muscle attachment scars on sabertooth limb bones suggest the cat was powerfully built. Saber-toothed cats may have used their muscular arms to immobilize prey and protect their teeth from fracture, she explained. To estimate how strong sabertooth forelimbs were relative to other cats, the researchers used x-rays to measure the cross-sectional dimensions of the upper arm and leg bones of fossils recovered from the La Brea Tar Pits in Los Angeles. They also measured the limb bones of 28 cat species living today — ranging in size from the 6-pound margay to the 600-pound tiger — as well as the extinct American lion, the largest conical-toothed cat that ever lived. The researchers used their cross-sectional measurements to estimate bone strength and rigidity for each species. When they plotted rigidity against length for the 30 species in their study, species with longer limbs generally had stronger bones. But the data for the saber-toothed cat fell well outside the normal range —while their leg bones scaled to size, their arm bones were exceptionally thick for their length. "When I looked at the arm bones, Smilodon fatalis was way out in left field," said Meachen-Samuels. Sabertooth arm bones were not only larger in diameter than other cats, they also had thicker cortical bone, the dense outer layer that makes bones strong and stiff. Thicker cortical bone is consistent with the idea that sabertooth forelimbs were under greater stress than would be expected for cats their size, Meachen-Samuels explained. Just like weight-bearing exercise remodels our bones and improves bone density over time, the repeated strain of grappling with prey may have resulted in thicker and stronger arm bones in saber-toothed cats. "As muscles pull on bones, bones respond by getting stronger," said Meachen-Samuels. "Because saber-toothed cats had thicker arm bones we think they must have used their forelimbs more than other cats did." "The findings give us new information about how strong their forelimbs were and how they were built," she added. "This is the first study to look inside sabertooth arm bones to see exactly how much stress and strain they could handle."